Let’s face it, bigger tires at lower pressures are a pain in the…rocks! If you’ve ever run larger-than-stock tires on a vehicle with manual steering, it’s easy to appreciate power steering. 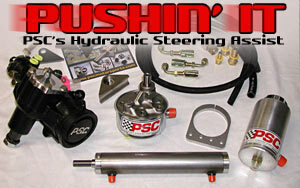 And, if you’re running even bigger tires, it’s time for the ultimate upgrade - a PSC Hydraulic Steering Assist system! Depending on your application, PSC’s kits have almost everything you need, including a hydraulic ram, heavy duty steering gear box, high pressure/volume pump, remote reservoir, mounting tabs, and high-quality hoses and fittings. 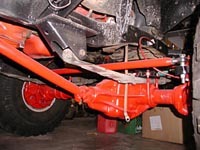 For years I’ve run stock Jeep power steering on my old CJ’s, with the only real performance upgrades being a Borgeson steering shaft, a Big Daddy Off-Road heavy duty steering gear bracket, a used steering gear out of a YJ, and a Currie Enterprises steering box brace. Now that I’ve upgraded from Scout Dana 44 axles to a Dana 60 and GM 14 bolt combo, and with plans to go to 44” tires in the not-too-distant future (hopefully), I felt it was finally time to upgrade my steering system. After considerable consternation, I decided to go the most durable, dependable way possible, and called the folks at Poison Spyder Customs and ordered the stronger steering components needed to do the job - high steer arms, heim joints, mis-alignment bushings, 1.5" .250 wall D.O.M. 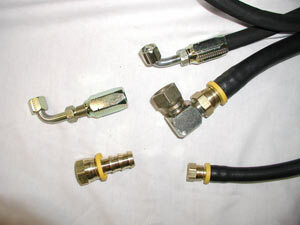 tubing, and tubing adapters. I also contacted Randy’s Ring & Pinion and ordered kingpin rebuild kits for the 22 year old Dana 60 front differential. 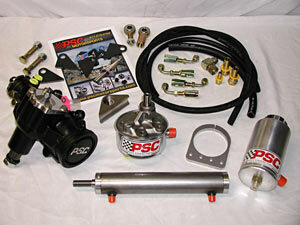 Once you’ve got stronger components installed, you’re ready for installation of one of PSC’s Hydraulic Assist Kits. It’s not really too difficult, but does require some good quality welding, and a bit of common sense. Let’s get to it! It really doesn’t matter what you do first, but let’s start with the gear box. No matter how hard you try, you’re going to make a mess, but one way to avoid a good portion of it is to use an old turkey baster to remove as much of the power steering fluid from the pump reservoir as possible first. 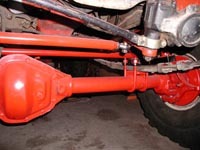 Next, remove the tie rod from the Pitman arm and the steering shaft from the steering gear input shaft, and all but one of the top steering gear mounting bolts. 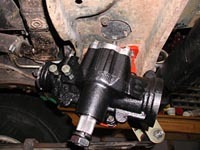 Then, loosen that bolt enough to gain more clearance to remove both power steering hose lines from the gear box, using a container to drain more power steering fluid from the pump and lines. 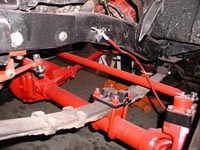 While supporting the gear, remove the last bolt completely, and set it on the bench next to the new PSC steering gear. 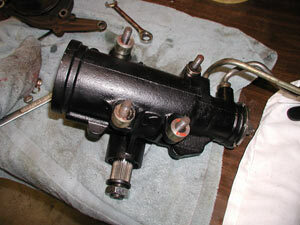 Then, remove the lines from the back of the old pump and loosely install them on the new gear. If these lines are old, now’s a great time to replace them. I then installed the plugs from the new gear into the old one for storage purposes. Normally, the steering box bracket uses all bolts to secure it to the gear, but the Big Daddy Off-road bracket uses studs and spacers which must be transferred from one gear to the other, in the proper orientation. Also, you must remove the Pitman arm with a puller. 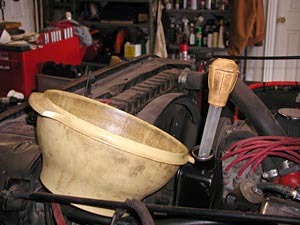 If it’s been on there awhile, try soaking it good with WD-40 and after the puller is installed and snugged down real good, hit the side of the Pitman arm with a good-sized hammer a few times. This will usually “convince” it to pop off. 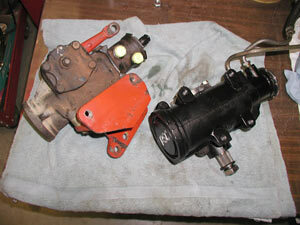 Regarding the Pitman arm, I replaced the relatively weak stock CJ arm with a heavy duty version from a Ford truck. It is almost exactly the same length, but the Ford arm doesn’t neck-down like the old one does. I’ve bent a stock CJ Pitman arm before. Imagine the extra force generated with the hydraulic ram. I suggest you replace this weak link now, not later - on the trail! I waited to install the Pitman arm on the new gear until after the box was bolted back on the frame. It’s a lot easier to tighten down that big nut then! You can either go ahead and install the box now or wait. It’s up to you. Next is the pump. This is a little more involved, but with a little patience and the right tools, it’s not too difficult. Depending on your application, you’ll need a pulley remover/installer to transfer your existing pulley from the old pump to the new one. I found an inexpensive version at good ol’ Harbor Freight that worked just fine. 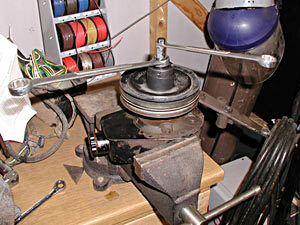 Remove the pump, noting how the brackets were installed, and stick it in the vise. If you don’t have a big vise, get one, or remove the pulley before you pull the pump off the engine. My CJ actually has three pieces to the bracket, and one is located under the pulley. Also note exactly how far the pulley was installed on the old pump. Assuming your belt(s) were aligned properly in the first place, this will help get the new one right the first time. 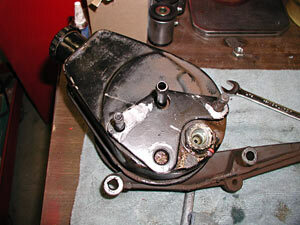 Use your puller to carefully remove the pulley and also remove the two mounting studs from the back side of the pump.